Abbie Neal, one of the sweetest TV cowgirls of the 1950s, sang about landing "EZ Credit," rolling with the "Tumbling Tumbleweeds" and "Ridin' Down to Santa Fe." In her day, Miss Neal was a world-class fiddler and star of several live TV and radio shows throughout the Pittsburgh region. Miss Neal died Feb. 15 in Reno, Nev., of a cancer-related illness. She was 85. Born in Brookville, Jefferson County, Miss Neal learned to play music at an early age and by 7 was playing duets with her brother at nearby churches and grange halls. After winning a fiddle contest at 10, she studied classical violin and performed with the Du Bois Symphony. Her love of country music was overwhelming, however, and in two years she traded violin-style bowing for down-home fiddle scratching and joined Cowboy Phil's country band on Greensburg's WHJB radio, where she worked for 13 years. Miss Neal later led the Wilkens Westernaires, a radio band named for their jewelry store sponsor. As the leader of Abbie Neal and Her Ranch Girls, she hosted a show on WAMO radio when it played country, and starred on several daily TV shows at Johnstown's WJAC, Pittsburgh's WENS and WDTV, precursor of KDKA. In her Western-fringed skirt and Stetson hat, she projected a kindly, maternal image, her younger band mates respectfully flocking around her like chicks to a mother hen. Following a traffic accident that left her hospitalized for 16 weeks, Miss Neal moved to Nevada in 1958 and headlined at resorts in Las Vegas, Reno and Elko. She won a national women's fiddle championship, and played steel and acoustic guitar. Miss Neal performed for U.S. soldiers in USO shows in South Korea, Japan, Taiwan, Guam, Hawaii, Greenland and five tours through Vietnam.After a long stint at Las Vegas' Golden Nugget, Miss Neal retired in 1975. One of her early fans, 7-year-old Lugee Sacco, of Glenwillard, never forgot her. By 1966, Sacco had changed his name to Lou Christie and struck gold with his No. 1 hit "Lightning Strikes. "In the late 1970s, after learning that she had retired in Reno, he called her. They forged a 20-year friendship that continued to her death. "Every morning before I went to school, I called her when she was a DJ on WAMO and requested 'If Again' by Doug Kershaw," said Christie, from his home in New York City. "I belonged to her fan club when I was 8 or 9 years old and I remember my dad taking me to the Allegheny County Fair and the WWVA Jamboree in Wheeling to see her. There was a kindness and sincerity that she projected, like the mother who didn't holler at you. "Christie said the tight vocal harmonies of his 1960s hits, including "Lightning Strikes," "The Gypsy Cried" and "Two Faces Have I," were inspired by Miss Neal and her country-western contemporaries. "Because of her i nfluence, I started listening to Hank Williams and other people in country who did those twangy, two-part harmonies," he said. "From there I graduated to The Everly Brothers and other bands, but my music has always had lots of vocal harmonies, and that goes back to Abbie Neal." 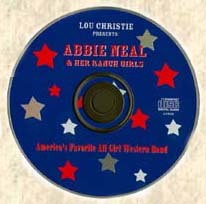 After years of correspondence, Christie assembled dozens of snippets from Miss Neal's TV, radio and stage performances and produced what became her final album, "Abbie Neal and Her Ranch Girls," available only on his Web site at www.louchristie.com. "She was a true pioneer of country music," Christie said. "She was a very modest, very wise woman. Everything that she did she approached with an honesty, sincerity and kindness that you don't see anymore." Abbie Neal, a country musician who entertained audiences in Reno and around the world for more than 50 years, died Feb. 15 at Manor Care Health Services after a lengthy illness.She was 85. 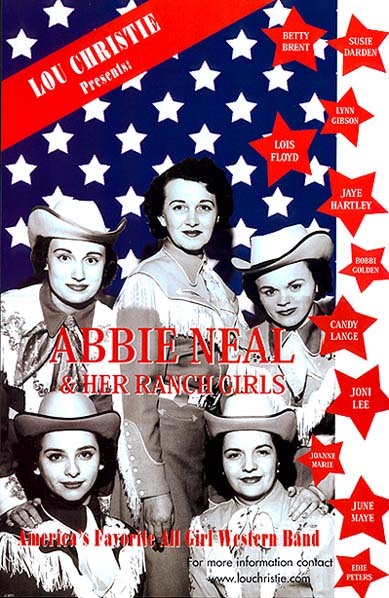 A Pennsylvania native, Neal moved to Reno in 1958 when her band "Abbie Neal and Her Ranch Girls" were booked to play at the Mapes Hotel. She ended up calling the Silver State home and played regularly at the Riverside and Holiday hotels, plus venues at Lake Tahoe, Elko, Ely and Las Vegas. "It soon dawned on me that there was the Mustang Ranch (brothel), so we changed the name to the 'Abbie Neal Show,'" she joked during a 2000 interview in the Reno Gazette-Journal. Her music career started when she was 8 years old after her brother taught her to play the violin. At age 12, she played for square dances with her brothers and cousins. A multi-talented musician, she specialized in the violin and steel guitar. Between 1944 and 1965, she performed for U.S. military troops in Korea, Japan, Taiwan, Guam, Hawaii, Greenland and in the South Pacific. She toured Vietnam five times. She ended her career in 1975 after a stint at the Golden Nugget in Las Vegas. After her retirement, she and several other retired musicians continued to entertain senior citizens at convalescent facilities, hospitals and senior centers in the Truckee Meadows. Before moving to Nevada, Neal had a radio show at WAMO in Homestead, Pa., and her own television show in Pittsburgh. In 1951, she was injured in an accident and spent 16 weeks in the hospital. Her fans in Pennsylvania rallied to help her. "I got over 600 hankies and little kids were sending in their allowance to help me pay my hospital bills," she said during the 2000 interview. "We donated that money to help the crippled children." The handkerchiefs were used to make a bedspread. She remained popular with her fans after retirement. In 1998, her longtime friend Joyce Linscott of Reno threw a surprise 80th birthday party for her. Neal received more than 700 birthday cards and dozens of flowers from family, friends and fans. She also received birthday greetings from President and Mrs. Clinton and letters from Pennsylvania Gov. Tom Ridge and Pittsburgh Mayor Tom Murphy. Neal was married to University of Nevada Hall of Famer Merrill H. "Mac" McKinnon for 27 years until his death in 1995. She is survived by a step-son, Barry McKinnon. A memorial service will be held at 11 a.m. Tuesday at the First Congregational Church, 627 Sunnyside Dr., Reno. delivered my membership card to the Abbie Neal Fan Club. would be appearing or on what radio station I could hear them. To Santa Fe come across the airways. 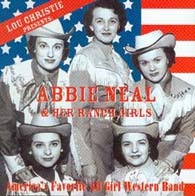 but, I never forget to mention Abbie Neal and Her Ranch Girls. now see in Oprah and Rosie O'Donnell. headline all the top casinos in Reno and Las Vegas. my radio dial to find an old friend to sing to me. her if I can be the next president of her fan club. Let's go home again.